Zombie May: Review of Isaac Marion’s "Warm Bodies"
For the last few years, zombies have been occupying movie trailers and they have always been relegated to the category of uninteresting, brainless, and worthy of remorseless violence. Typically, zombies serve the role of being easy targets for frenetically paced action sequences in zombie movies that oftentimes lack interesting characters, or even a remotely fascinating story. Some novels, such as Carrie Ryan’s The Forest of Hand and Teeth, conversely deeply developed the characters who were futilely seeking a safe refuge throughout the story, where they would be safe from the disorganized squaldron of mindless zombies pursuing them. While the zombies were not developed creatures, the novel focused keenly upon development and relationships among the human characters; therefore, there was not a serious need to have the auxiliary zombie characters become the large focus of the story. Remarkably, Isaac Marion’s Warm Bodies is antithetical to the slew of zombie stories, where the emaciated creatures never receive the same serious attention or development that their counterparts, vampires and werewolves, have received over the last couple years. Occasionally, a minority vampire fans express their ire over the evolved form of the vampire, who has now become far more capable of serious philosophical thought all thanks to one of my favorite writers, Anne Rice. 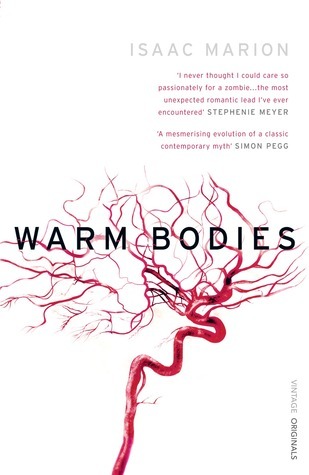 Fascinatingly, Warm Bodies focuses primarily on the enigmatic perspective of the zombie, and it becomes one of the most interesting fictional perspectives that I have read in a story in a long time. There is a division between thoughts that can be articulated verbally, and the richness of the thoughts that remain in our minds. How can R, the main zombie character who remarkably gropes through the morass of his seemingly blank mind throughout the book, have this intrinsic intelligence remain accessible in his mind? While “R” has trouble producing his mess of confusing thoughts into words, the fact that he is able to make insights, and synthesize relationships between different events around him reveals that zombies may not be entirely mindless. The question the novel begs is whether or not our minds are wholly material, or perhaps the illustration of materialism that scientists sometimes legalistically depend upon may be limited. Isaac Marion follows in the symbolic footsteps of Anne Rice and Mary Shelley, whereupon he completely reinvents the zombie and makes the creature more capable of mystery and depth. Additionally, like Madeleine L’Engle explored the paradox of time and inter-dimensional space in her Time Quintet, Warm Bodies posits different scientific theories about the puzzling nature of our minds, and open doors for further examination of a mind that we minimally understand. Interestingly, we only use about twenty percent of our minds. As a result, a mass quantity of our brains, a whopping eighty percent, is left unused. Maybe zombies are only mindless because they lost certain fundamental uses of that twenty percent of the mind we normally use. Again, this book just left me feeling very inquisitive about the nature of our minds, the expansive mystery of our lives, and the tremendous ability for human tenacity to outwit the most depressing,nihilistic frame of mind. We have constructed institutions and religions to help secure that hope that aids us in surviving some of the most improbable odds. Much like The Road, Isaac Marion presents the apocalypse in a way that isn’t just driven by sophomoric violence, but captivates us with the indeterminate way that human beings cognitively face extreme, devastating odds. This book is just a cerebral gem that can be appreciated by the same people who were stirred by the same philosophical questions of Anne Rice’s novels or Joss Whedon’s Dollhouse. It is neither just a zombie romance or a brainless gore fest; this zombie book is much like the complicated nature of our minds. The story is a rich conundrum that celebrates the dark mystery of our lives, and the astonishing ability for humanity to endure the moments of apocalyptic darkness in life. While R’s zombie perspective might be jarring and confusing at points. Isaac Marion wonderfully uses that confusion to help us explore the deeper dimensions of a zombie’s mind. This books comes with a high recommendation! Now, I really love zombies!